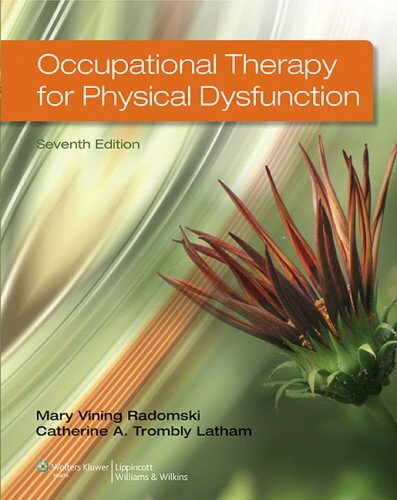 Succeed in the course and master the concepts and skills you need to be an effective, reflective practitioner with Occupational Therapy for Physical Dysfunction, 7th Edition. The authors introduce the highly acclaimed, easy-to-understand Occupation Functional Model (OFM) in the first section, setting the stage for subsequent discussions that guide you through the assessment and treatment of adult patients with physical dysfunction from initial evaluation to treatment to follow-up. Featuring engaging and practical coverage, the Seventh Edition includes the latest research in the field, new activity analysis case examples, new photos, new online videos, and a streamlined organization that includes 45 chapters in the print textbook with three additional chapters posted online. Develop a theoretical foundation to guide your professional decisions through the OFM framework used consistently throughout the book. Access the best evidence for the effectiveness of the interventions discussed in the text with Evidence tables that summarize research studies. Prepare for professional practice with Assessment tables that highlight the psychometric properties and the strengths and weaknesses of individual assessment methods. Understand how chapter topics inform occupational therapy practice with Case Examples that describe both the occupational therapy process and the clinical reasoning behind the interventions. Broaden your understanding of occupational therapy practice with Procedures from Practice, research notes, safety notes, clinical reasoning examples, and review questions. Maximize your study time with learning objectives, clinical reasoning questions, and a comprehensive glossary. Extend your learning online with a wide range of resources, including compelling videos that bring key concepts to life, answers to the book’s Clinical Reasoning questions, and Learning Objectives, as well as access to the fully searchable eBook online.